Lazeez closed in February 2018, and will be replaced by a new restaurant, apparently called Afghan. I’ve left this review up for posterity. Pardon the pun, but eating out is often about your gut reaction, and some of the oddest meals I’ve had while reviewing have been ones where my head tells me one thing and my gut tells me another. Usually, that happens in fancy, precise, pristine places: my head admires the artful arrangement of ingredients on the plate and the provenance (which always, however well-intentioned, has a whiff of name-dropping about it) on the menu, but my gut tells me this is food for people who love to tell people where they’ve eaten, rather than food for people who love to eat. Lazeez, a newish Pakistani restaurant down the Wokingham Road, is that unusual beast, the same phenomenon in reverse. I can see lots of reasons why I would dislike my meal there, so how come I didn’t? I went partly because despite being three months old it had nearly no digital footprint whatsoever – no reviews, nothing on TripAdvisor, although I’ve been told by one reader that it was easily as good as House Of Flavours. But also, I was also intrigued by the notion of a Pakistani restaurant, as I don’t think Reading has any others which specifically identify themselves as such. In a rare piece of research not involving Wikipedia, I even asked a colleague at work, currently planning his wedding in Islamabad, what Pakistani food is like. “Pretty much the same as Indian”, he said. It’s an interesting place to open a restaurant, two doors down from Miah’s Garden Of Gulab, which either demonstrates huge confidence or a fundamental lack of market research (even now, having eaten there, I can’t decide which it is). But it’s quite a nice room, a big square with booths and banquettes round the edge and tables in the middle. One interior wall has rather tasteful brick-effect tiles, another has very attractive lattice-work with lighting panels behind it which, disconcertingly, change colour on a regular basis. I can imagine on another, busier, night it could all be a bit much, but on a quiet weekday night (and it was quiet – we were the only table there) I rather liked it while at the same time knowing I shouldn’t. It was a disconnected feeling I had to get used to. Certainly the menu was compact by the standards of Indian restaurants I’ve been to: no poppadoms on offer, a smallish selection of starters, a similarly manageable range of mains (grilled, chicken, lamb or vegetarian) and a handful of specials, including lamb trotters – maybe another time, eh? – and the only seafood main on the entire menu. Two other things jumped out from the menu. One is that the restaurant doesn’t have an alcohol licence, which I suppose will rule it out for some people but didn’t bother me. The other, more significantly, is how inexpensive everything is: most mains hover around the six pound mark, the costliest starter is four pounds. So, cheap and nasty or cheap and cheerful? The starters were the first evidence. Shami kebab, which I ordered as a change from the usual sheekh kebab, sounded interesting – a mixture of finely minced lamb and ground dal. I liked it more in theory than in practice – two round pucks which had a vague flavour of lamb but none of the texture that goes with it, and a heat which went from “meh” to “my word” by the end of the dish. If anything they were more like spicy rissoles, which sounds more like a euphemism for a medical complaint than something you’d clamour to pick off a menu. Chicken tikka was a more traditional choice and was better, if not perfect. I was a bit surprised by how neatly cylindrical it all was, cut into equal sized chunks by someone very good at cutting things into small chunks (a trick which was to be repeated with the main courses). It was quite tasty, if a little bit lacking in the tenderness of the best examples I’ve had in Reading. I couldn’t decide how I felt about it, torn between “this is only four pounds!” and “well, it’s only four pounds”. Both starters came with a perfectly decent selection of perfectly decent raita, mango chutney and something a bit like a hot chilli mint sauce. 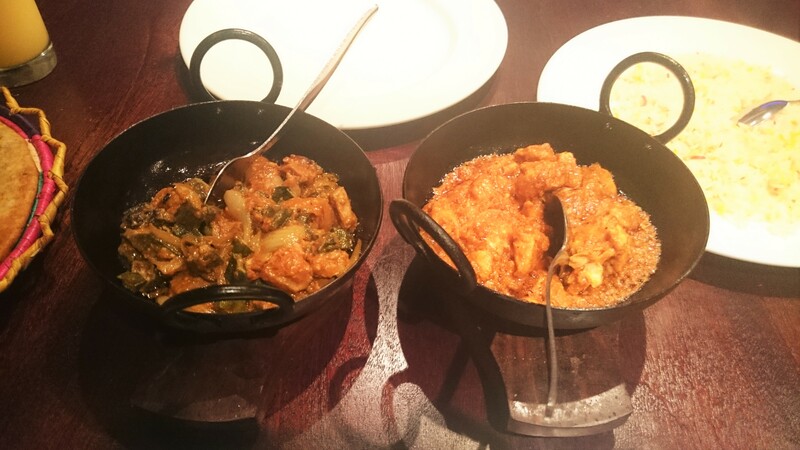 No sooner had the starters left than the mains, two sizzling karahi dishes on little wooden stands, were whisked to the table. This is one of my pet hates in any restaurant, and more than anything it made me wonder if Lazeez quite got how restaurants are meant to work. I understand it must be dull standing around in a kitchen when the room out front only has two customers in it, but that’s no excuse to curtail what’s meant to be a pleasant, leisurely evening for those two customers. Still, I could hardly send them away and again, I found myself thinking that given the price perhaps I was the one with the wrong expectations. Karahi chicken was pleasant. Chunks of chicken and, I think, some little shreds of chicken were in there and I spotted a few little batons of ginger on top. The sauce was red, a little spiced but pretty unremarkable. The whole thing was a little well-mannered for me, as if someone had fitted a normal dish with a silencer. It was also ever so slightly on the small side and the pieces of chicken were also a tad diddy, especially if you’re used to the massive pieces in many Indian restaurants where you have to cut them in half or risk somebody having to perform the Heimlich manoeuvre. Still, at the risk of repeating myself, it was six quid. The star of the night was the bhindi gosht – lamb curry with okra. The okra was what made it – sticky rather than slimy, still firm and really quite delicious with the gently spiced sauce and the sweet shreds of onion. This managed to be subtle rather than bland, in contrast to the karahi chicken which got that balance wrong. But again the pieces of lamb, though tender and soft, were small and few and far between. Both dishes, the karahi chicken and the bhindi gosht, were shiny with oil to the extent where I had slight misgivings. Rice was rice, no surprises there. There wasn’t enough sauce to need it all. More of a clanger was the aloo paratha. I love paratha; I know it’s unhealthy but there’s something about those buttery layers of bread that makes me come over all unnecessary, and the idea of such a thing stuffed with potato really appealed to me. 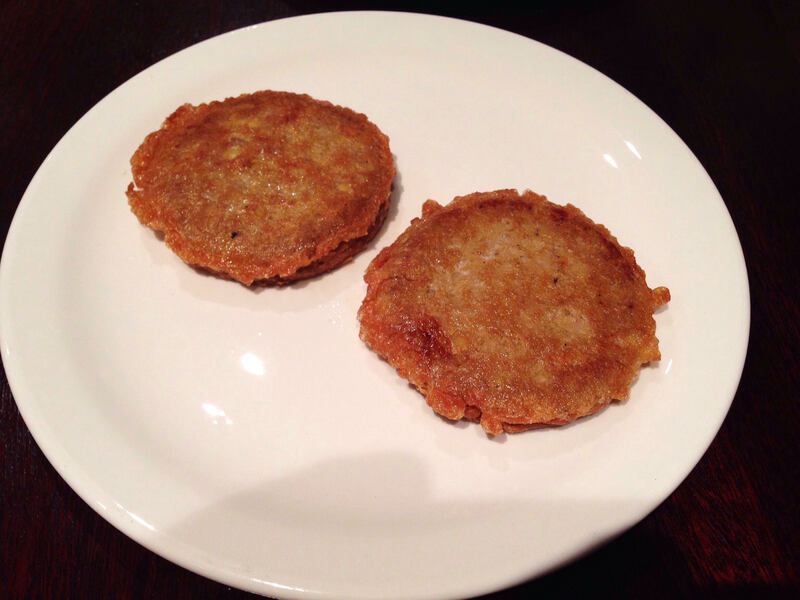 Unfortunately, what came out was a stodgy, oily thing, the shape of a frisbee, full of cubes of potato and peas as you’d find in the middle of a samosa. Arg and Lydia from The Only Way Is Essex are switching on the Broad Street Mall lights this weekend, but even those two combined are not quite as dense as that paratha was. We abandoned half. On a more positive note, possibly due to the lack of an alcohol licence, Lazeez doesn’t just do glasses of mango lassi. Oh no. They do a jug of the stuff. For seven pounds. It’s not every day you can go into a restaurant and say “and I’ll have a carafe of the mango lassi” and they deserve some credit for that alone (it was very nice too, to the extent where I wish I’d skipped the shami kebab and had a jug to myself). I should also say that service was lovely, if a tad eccentric. 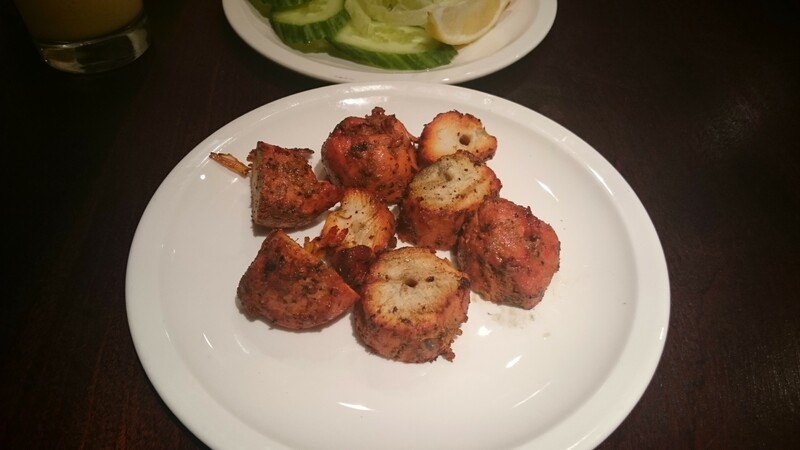 Obviously there are no real excuses for a meal which took – no word of a lie – forty minutes from start to finish, but the waiter was very friendly and genuinely interested in us, what we thought of the food and the Indian restaurants around town. Dinner for two came to thirty-two pounds, not including tip. We didn’t have dessert, mainly because my stomach felt more oiled up than a Chippendale. Sometimes the act of writing a review is the final thing that crystallises my view of a restaurant. You’d think that would happen here, and yet despite all that’s gone before I feel a certain warmth towards Lazeez. Yes, there were lots of mistakes – the timing, the execution of some of the dishes, their oiliness – and yet it feels like Lazeez is a chrysalis from which a good restaurant might at some point emerge. I even wondered whether I was really in the target market for Lazeez or whether it’s aimed towards the Pakistani community in Reading (it wouldn’t necessarily surprise me; on my way home I wandered into Home Taste across the road and asked if I could look at a menu. “Not unless you’re learning Chinese” grinned the man behind the counter). Crucially, what might keep Lazeez going is that it fills a gap in the market; it’s cheaper than most of its competitors and it’s an easier, more casual place to grab dinner (especially before going out drinking, or if you’re with teetotallers) than Miah’s. Put it this way, given a choice between the two I’d still go to Lazeez nine times out of ten, even though ten times out of ten my head would probably tell me that Miah’s is a “better restaurant”. But that’s how it goes: the gut wants what the gut wants, after all.